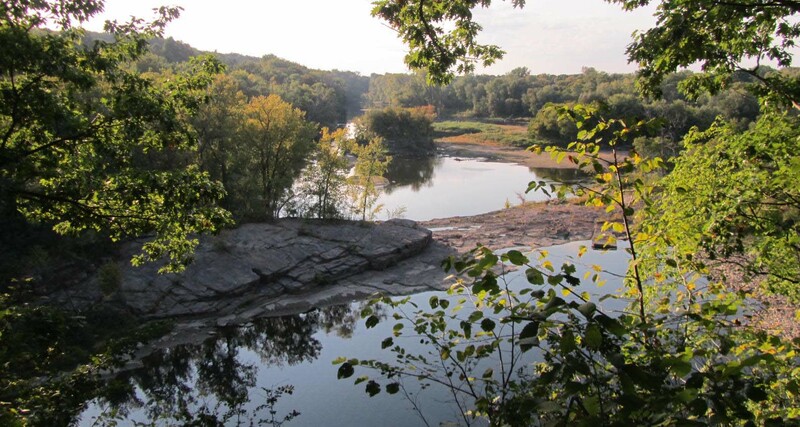 The Winooski Valley Park District’s mission is to plan, acquire, and manage lands and waters within the boundaries of its member municipalities in the Winooski River Valley for purposes of conservation, preservation of natural areas, establishment of parks, and resource-based education and recreation. The WVPD’s Master Plan provides guidance to achieve this mission. The idea of a “Winooski Valley Park District” originated in the mid-1960’s when a proposal to develop a park along the Winooski River between Bolton Falls and Lake Champlain was drawn up (WVPD, 1981). A public opinion poll of river valley residents suggested that canoe and boat accesses, trails to the water’s edge, picnic areas, and bird and wildlife sanctuaries be established (WVPD, 1981). In 1966, Dr. Henry Farmer, then acting President of the Burlington Board of Alderman, proposed the concept of an inter-municipal park District (Ely, 1987). His hope was to preserve many of the natural areas along the river, which are part of Vermont’s heritage of history, culture and beauty (Ely,1987). Farmer’s vision stimulated participation by a wide range of groups including numerous state and local agencies, conservation groups, the University of Vermont (UVM), and citizen volunteers to work together for planning for such a parks system (Ely, 1987). In March of 1970, enabling legislation was enacted by the State of Vermont to accommodate the idea of an inter-municipal district. This allowed for the creation of a union municipal district by two or more municipalities. This would be essential for the success of the Park District and would allow member towns to pool their resources in conservation efforts. In 1972, after more than seven years of planning, including laying the legal framework and educating the public, the five riparian municipalities of Burlington, Colchester, Essex, South Burlington and Winooski decided by majority vote to endorse the idea, and the Winooski Valley Park District (WVPD) was formed. In March of 1987, Williston and Jericho voted to join as well (Ely, 1987). These seven towns are the current members of the Winooski Valley Park District. Each member town designates a Representative to serve on the WVPD Board of Trustees. The Trustees provide policy direction and serve as the primary liaison between the member communities and the WVPD staff (WVPD Master Plan, 2012). The WVPD is a public non-profit that manages one of the largest systems of urban natural areas in Vermont (WVPD,2012). Since it’s founding in 1972, the WVPD has acquired over 1700 acres of land in the Winooski Valley (WVPD, 2012). The WVPD has developed picnic facilities, hiking trails, public garden plots, canoe accesses, fishing accesses and educational programs. This collaboration of towns has helped to conserve nearly 13 miles of shoreline (Lake Champlain, Winooski River, Colchester Pond and the Browns River) and developed nearly 24 miles of hiking trails. The WVPD has worked with individual towns, the Vermont Land Trust, the Land and Water Conservation Fund, and private landowners to acquire and conserve a variety of habitats within the Winooski River watershed. Ely, Jennifer. Status Report for the Winooski Valley Park District. 1987. P 1-3. Winooski Valley Park District. Park District News, Volume 1 Number 1, Burlington, VT. 1981. P-2. Winooski Valley Park District. Winooski Valley Park District Master Plan. 2012. P-1.